Yamaha launched its new quarter-litre sports bike - the FZ25 , in India on Tuesday. With this bike, Yamaha marks its presence in the burgeoning 250cc segment and also bridges the gap between the Yamaha R15 v2.0 and the YZF-R3. The FZ25 is also the most powerful Yamaha to be manufactured here. The Yamaha FZ25's styling is inspired by the smaller FZ-S and the M-Slaz that is sold in Indonesia. Like all Yamaha nakeds, the FZ25 gets a chiselled fuel tank, sharp looking tank shrouds and a tiny LED headlamp. The tail lamp gets an LED unit as well. The exhaust is inspired by the new FZ series and promises a meaty exhaust note. The bike gets an all-digital instrument console with an LCD display which is comprehensive and shows instant and average fuel economy with other information. The bike will come in three colours - Knight Black, Ballistic Blue and Warrior White. 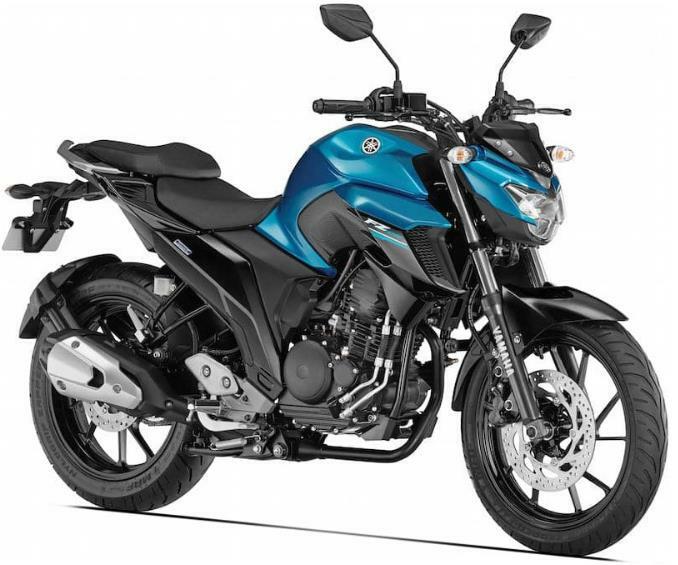 The Yamaha FZ25's engine and cycle parts are derived from the Fazer 250 sold in Brazil but get Yamaha's Blue Core technology and is BS IV compliant. The 249cc oil-cooled and fuel-injected single makes 20.9PS and 20Nm of torque. The performance figures are slightly different from the Brazilian-spec model and also lower than the competition - the TVS Apache RTR 200 and KTM Duke 200. Yamaha says the bike has been tuned for good rideability in Indian traffic conditions. Power is transmitted via a 5-speed gearbox from the Fazer 250. The bike weighs 148kg which is quite good for the segment. Also, Yamaha claims a mileage of 43kmpl. Compared to the FZ-S, the bike gets a sportier riding position with flatter bars, forward-mounted seat and a rear-set footpeg. The 1360mm wheelbase is 30mm longer than the FZ-S. The 160mm ground clearance is similar to the FZ-S. The bike gets 41mm front forks and the rear monoshock from the smaller FZ with wider tyres mounted on new alloys. The bike will get a 282mm front disc and a 220mm rear disc. ABS has been given a miss to reduce costs though Yamaha says they are working on introducing it later. The FZ25 is priced at Rs 1.19 lakh (ex-showroom Delhi) which is Rs 4,000 more expensive than the R15 v2.0.